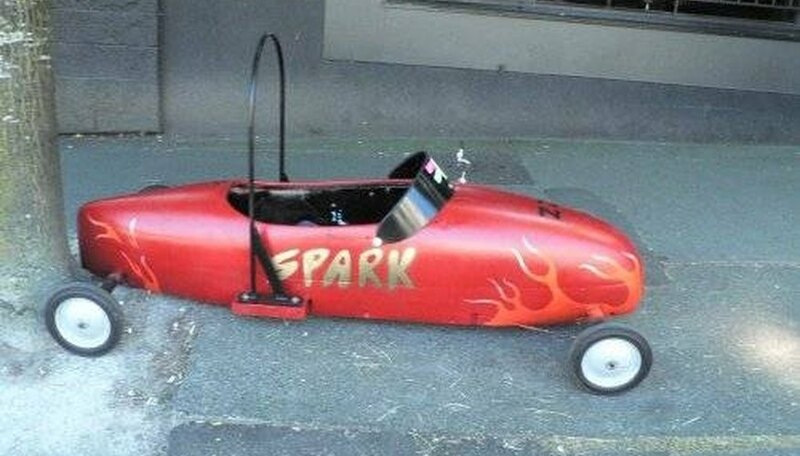 The soap box derby car is a small, handmade car with no motor that is run solely on the power of gravity. It can be built using simple materials, and the popularity of the soap box derby has made even high-tech materials like fiberglass a common component. Anyone can build a soap box derby car with simple blueprints or with the help of a kit. Begin by selecting the materials you're going to use to construct your soap box derby car. If you're building a car for recreation there's no limit to the kind of materials you could use. If you're going to compete you'll need to choose carefully. Shape the base and flooring of the car. At this point you should know if you wish to use a narrow, pointed nose or a bulbous nose. You'll also want to know if you plan on rounding the chassis itself or if you wish to use a sloping, triangular design. Set up the rigging that will support and house the wheels. The back wheels remain stationary, but the front wheels need to incorporate the turning mechanism. You can either use simple rope or you can select a more sophisticated steering system using a steering wheel. Attach the upper chassis and main body of the soap box derby car. It is important to line up the sections accurately before you begin to fasten it into place. If it is placed even slightly askew then the problem will become more pronounced at other points on the car. Use duct tape or clamps to hold the chassis in place to prevent slipping. Use a lacquer to finish your soap box derby car once construction is complete. It doesn't generate a marked difference in overall performance, but glossy finishes do show a small decrease in the overall drag of most designs. Be aware that if you plan on racing your soap box derby car you need to avoid certain building materials. Read the rules carefully for the derby you wish to enter as even glue is sometimes forbidden. Always supervise children when you build a soap box derby car. There are many different ways in which they could be hurt, so don't let younger enthusiasts build their cars without adult supervision.